In the 1850s, despite two brief terms as capital of the Province of Canada, the fledgling town of York was really just a collection of medium-sized businesses and homes with big ambitions. What many felt the community lacked at this stage in its development was a first class, luxury hotel to cater for visitors with money to spare. Often described as "palace hotels", most North American cities had at least one well appointed, oppulant accommodation decked out with the latest comforts. At the time, the Sword's Hotel and American Hotel on Front Street were the most popular choice for visitors with the money to be looked after. In February 1855, Charles and Marcus Rossin, successful jewellers and land speculators, bought a plot of land on the southeast corner of King and York with plans to build a truly palatial hotel worthy of the town's up and coming status. When York's official surveyor and engineer, John George Howard, declined to design the building the Rossins held a competition to find a stylish look for their new business. Open to American and Canadian architects, designs were submitted from as far away as New York and Baltimore but the winning entry came from Buffalo and a Mr. Otis. 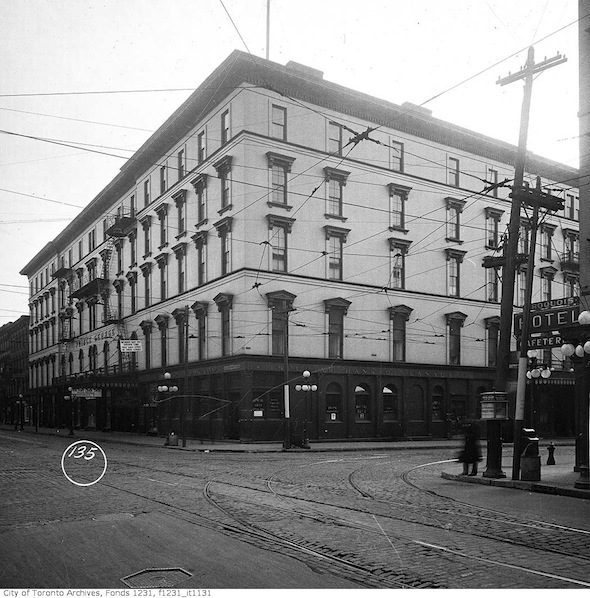 Started during a building boom, construction began slowly on the Rossin House Hotel due to a lack of builders in the city. By the time shovels broke ground a new designer, William Kauffman of Rochester, had taken over the project and added many fire safety features to the plans. Kauffman had included cast iron exterior details and a special load bearing system to the building when the hotel was completed and opened in May 1857. Built to include an interior courtyard with lush gardens and a babbling fountain, the hotel's main rooms with tall windows and nineteen-foot ceilings were on the second floor above the stores facing King and York streets. Several deluxe suites and drawing rooms were also included in the floor plan for society's crème de la crème to entertain. All guests of the Rossin House Hotel, deluxe suite or otherwise, could expect to sleep in well-ventilated, heated comfort with access to both hot and cold water (it's amazing what constituted luxury back in the day). In the dining room, thanks to a surviving menu, we know hearty staples like cold tongue, corned beef, ham and mutton were on offer alongside more exotic dishes like "Oyster Patties-French Style" and "Veal Currie-East India Style." The wine and spirit list boasted pricey bottles of Moët & Chandon Green Seal and Roederer's Carte Blanche for guests prepared to splash the cash. Prior to its completion, the hotel, one of the tallest in York, was used to take the first panoramic photograph of the city. The low-rise, residential community in the pictures is practically unrecognisable as Toronto save for the presence of Osgoode and St. Lawrence Halls. For this reason the series, taken by Armstrong, Beere and Hime, provides one of the best glimpses at our humble beginnings and is available in its entirety in the City of Toronto Archives. 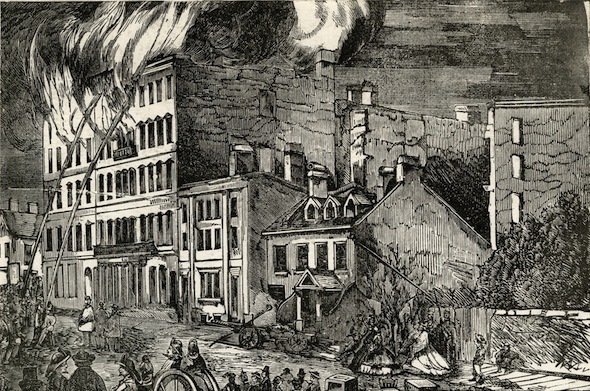 In November 1862, just five years after the hotel's grand opening, William Kauffman's fire safety additions paid dividends when the building was completely gutted, leaving only the exterior walls standing. All but one of the guests and staff managed to escape the building safely, a testimony to the multitude of stairways and dedicated cold water supply for firefighters available on the site. With the Rossin House a smouldering wreck, the Rossins abandoned their hotel business and ownership of the site fell to James G. Chewett who embarked on a slow rebuilding process through 1863 and 1864. William Kauffman, who was retained as the designer, made very few changes to his original plans and the restored hotel opened again on the 1st August, 1867. Over the next sixty years the Rossin House gradually lost its appeal as a luxury destination, slowly falling behind the times in terms of features compared to the newer Royal York and King Edward hotels. In the early 1900s the Rossin House was sold and renamed the Prince George. It saw various uses until it was demolished in 1969. Were it still standing today, the Rossin House would be on the site of the Standard Life Centre opposite Exchange Tower. 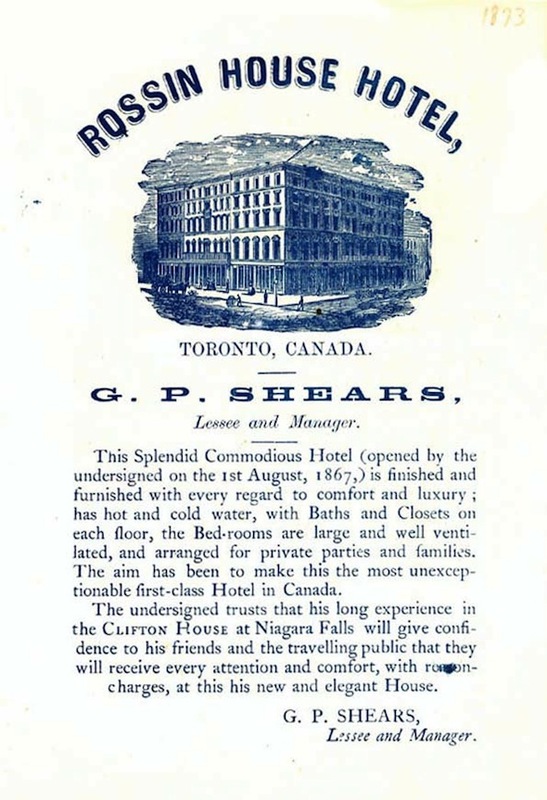 For more on the Rossin House Hotel and the panorama photographs, see William Dendy's Lost Toronto. Lead Rossin House Drawing, 1870, Archives of Ontario. 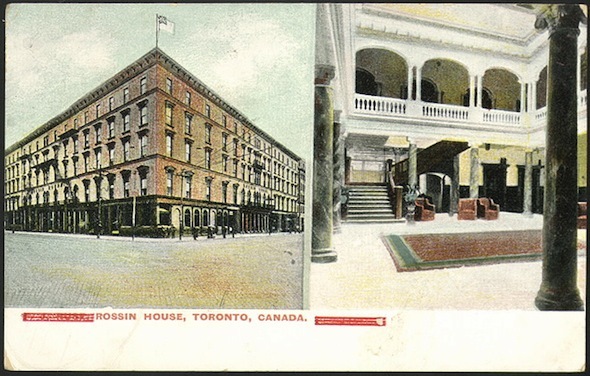 Rossin House Postcard, 1910, and Burning of the Rossin House, 1890, Toronto Public Library. Rossin House Advert and all other images City of Toronto Archives.